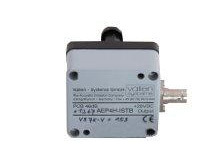 Vallen Systeme offers a number of extremely robust preamplifiers perfectly suited for use with most AE systems or as stand-alone when employing the decoupling unit, Model DCPL1. Bandwidth and performance can be selected to match the test requirements. Their consequent design with matching 50 Ohm impedance and their low noise input stage make them unique on the market. Only selected components and materials are used to ensure reliable operation even under difficult operating conditions. Multipurpose preamplifiers for the frequency range from 3 – 2000 kHz (AEP4H: 20 – 2000 kHz) are suitable for most applications. Each comes with a rugged case and a calibration bypass for the sensor coupling and wave velocity test. Preamplifiers based on electronic design of AEP4H. The preamplifier housing is adapted in order to hold an AE-sensor (integrated sensor) and it is equipped with three strong magnets. Because of the integrated design, AE-signal amplitudes are higher compared to standard combination of AE-sensor connected to AEP4 preamplifier over 1.2m long sensor cable. The strong magnets allow easy installation and guarantee constant contact pressure throughout the test. The AEP4H-ISTB is suitable for sensors with V-type housing. It is commonly used in tank floor inspection applications. Amplification of an AEP3N can be selected in the range from 34 to 49 dB via software when used with an AMSY-5 or AMSY-6. In standalone usage gain is set by jumpers. Exchangeable frequency filter modules allow for the use without steep downstream frequency filters. AEP3N provides two inputs, one with the common single-ended BNC connector and the other with a differential BNO connector.